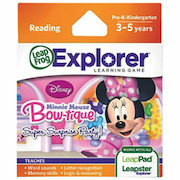 The Disney Minnie Mouse Bow-tique LeapFrog Explorer learning game helps build reading, memory, and creativity skills. Join in on the fun at Minnie's Bow-tique as Minnie and Daisy are getting ready for a secret surprise party and help them turn ribbon and dazzles into beautiful bows for all their friends. Make a splash with these swim-ready friends!.